Lahore, get yourselves ready for the ultimate excitement, fun, and shopping! The Packages Mall Winter Shopping Festival 2018 is almost here! From November 16th all the way up to December 28th, 2018, come down to Packages Mall for a winter shopping extravaganza! This is the best time of the year to let your inner shopaholic out! For over a month, you will have plenty of chances to buy to your heart’s content, with amazing sales and fantastic discounts offered throughout the mall! And that’s just the beginning! Packages Mall is looking to reward you for all your shopping at their stores with a very special and exclusive offer; spend at least Rs. 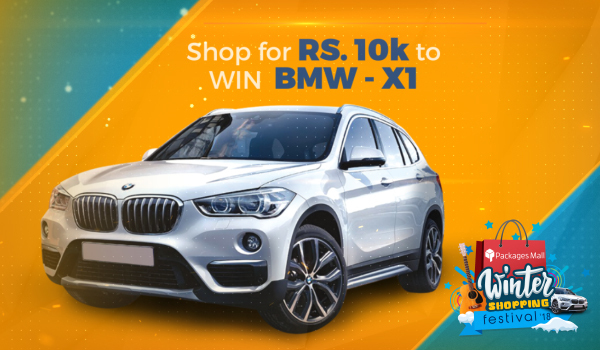 10,000 at the mall in one trip and enter into a lucky draw, taking place on 29th December 2018, for a once in a lifetime prize, a BMW X-1 for you to take home! In addition to this, you can redeem your receipt for shopping of Rs. 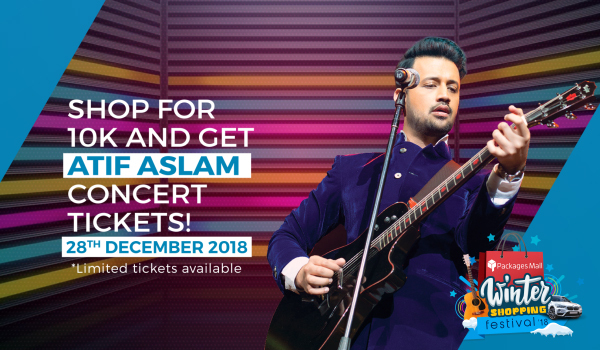 10,000 for a ticket to see none other than Pakistan’s heart-throb Atif Aslam live at Packages Mall on December 28th, 2018 in a concert that will end the Winter Shopping Festival with a bang! We bet your visit to Packages Mall Winter Shopping Festival will open your eyes to the best winter feels with amazing décor that will bring you back to the mall, not once, not twice, but every day! Things can’t get better because Packages Mall is partnering up with Uber to bring you to them, by using the promo code Ride2PackagesMall for 50% off on 2 rides during the festival duration. And even that is not the end of it! Throughout the course of the Winter Shopping Festival, there will be lots of fun activities and enjoyable ways to spend time with friends and family at Packages Mall with chances to win fantastic prizes in the mall as well as on the @PackagesMall Facebook page! From live musicians playing their pianos and violins, shuffle-dancing to mannequin artists, a home and décor festival, a week of fitness fun, kids entertainment, magic card players, jugglers, bowling alley, life-size ludo, kick dart, chess, wall art and what not! You name it, we’ve got it! Marketing Team at Packages Mall is again ready to make waves with their out-of-the-box fun ideas to take Lahore on the best shopping spree. It’s a norm at Packages Mall to improve its customer’s lifestyle by providing massive shopping deals and endless entertainment every time! So get ready to enjoy the biggest, yet the best festival of 2018 where every day is full of surprises for everyone!